Kitchens are considered the hearts of homes which spread energy to all family members and invited guests. Investing in a warm kitchen decoration requires relying on someone as gifted and reliable as Paige to save you time, money and energy and give you perfect results. Paige has a Bachelor of Arts from UC Berkeley, a certificate in sustainability from UC Berkeley ext., and 10+ years of global project management. She also attended the Interior Architecture and Design professional certification program through UC Berkeley ext. Moreover, she is a certified green building professional through (CGBP) Build It Green. 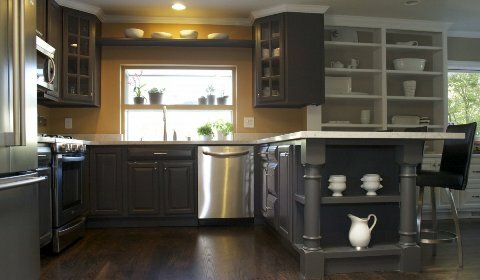 This appetite opener kitchen stands as a focal point in the house. The decoration of this kitchen merges beautifully with the surrounding environment by the help of the colors of the tiled backslash and the continuity of the hardwood flooring. In addition to being in style and appearing in modern kitchen magazines, hardwood flooring is easy on the feet of those who stand for a long time to prepare delicious meals. 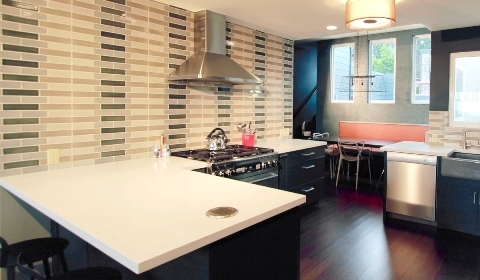 The white countertop surfaces reflects the well thought lighting making the kitchen a spacious inviting haven. Bright joy radiates from this kitchen style. 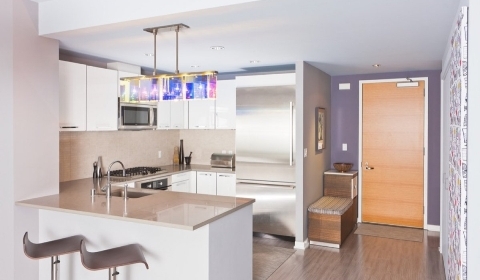 There is just something about a brightly colored kitchen that merges perfectly with the concept of food preparation. A crisp, clean feeling, an enhanced sense of space and excellent style versatility are all features which are represented by the use of neutral colors in the kitchen. The white cabinets and the stainless steel fridge are defiantly promoting the cleanliness factor. At the same time it doesn’t seem overly clinical especially with the flavor provided by the magnificent yet simple lighting fixture overhead. Individuals looking for a majestic kitchen that would last forever would certainly adore this kitchen design. The marble countertops are the most significant luxurious parts of this kitchen. One of the biggest benefits to choosing a marble countertop for the home is the natural beauty of the stone. The black clear flooring and the frosted glass hanged cabinets induce a sense of mystery that intensifies the lavish design. The coordination of plants on different countertops makes the kitchen very welcoming. Magnificence of classic design and eye-catching modern design both meet to make up this cozy kitchen. Classic sense is noticed in the white pottery and the dark wood cabinets with their traditional carvings. 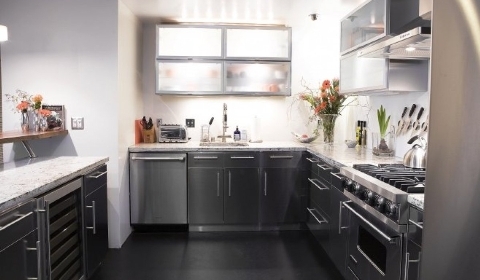 Modern touches are seen in the stainless steel appliances. The orange backslash gives the kitchen an affectionate mood which is supported by the natural light entering gracefully from the window shedding light on the plants. How to make a great Interior Design Portfolio ?